On-ear design with a 40mm driver that delivers detail and accuracy. 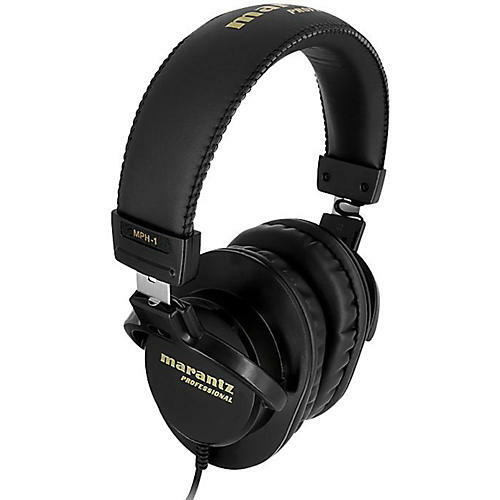 Marantz Professional’s MPH-1 headphones feature powerful 40mm drivers and a comfortable on-ear design, perfectly suited for both long hours in the studio monitoring in-field recordings or listening to music. With their authoritative 15–28kHz frequency response, the MPH-1 delivers the detail and accuracy needed to accurately evaluate every recording. The leather cushioning on the flexible headband and ear cups provides a fatigue-free listening experience for even the longest-lasting, most demanding sessions and their rugged stainless steel telescopic arms easily stand up to heavy-duty use. An impedance of 32Ω and 95dB sensitivity ensures compatibility with the widest range of equipment. The MPH-1 includes a 1/8" to 1/4" adapter and brings Marantz Professional’s industry-leading field recording engineering to professional headphone audio. Order the MPH-1 headphones today for an accurate representation of sound!